Single Case Deal 6 Bottles. Teas & Sugar Frees Not included. 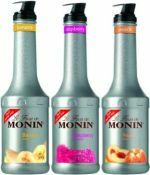 Monin Syrup 2 Case Deal 12 x 70cl. Teas & Sugar Frees Not included. Single Case Deal 4 plastic Bottles. Sugar Frees Not included. Teas not Included! Three Case Deal 12 plastic Bottles. Sugar Frees Not included. Teas not Included! Caramel simply means caramelized sugar, traditionally obtained by melting sugar in a sauce pot of water. The rich flavour and colour of caramel derive from the process of heating and melting the sugar. Caramel is appreciated as the main flavour and is also used in harmony with other flavours. With versatile MONIN Caramel, endless applications are possible! Caramel flavour is used in specialty coffee beverages, cocktails, desserts, and culinary applications. The strawberry is the first fruit of spring. Everyone looks forward to these sweet and delicious berries. Strawberries are one of the most common fruits in the home garden for both their ease of growth and popularity at the table. Delicious strawberries are eaten fresh or used in making juice, desserts, jams, wines and syrups. Enjoy the fresh delicious taste of MONIN Strawberry in all your beverages! Finest Call 6 x 1Lt.